October might be National Seafood Month, but in the coastal city of Bellingham, Washington, every month is a time to celebrate the bounty of the ocean. Seafood is part of the very identity of Bellingham, a city of about 90,000 only about 20 miles south of the Canadian border. The commercial fishing industry here supports around 2,800 jobs and generates $320 million in business revenue. As part of my Knauss Fellowship, I had the pleasure of experiencing the rich maritime culture there during a quick visit. And it’s not just Bellingham. Seafood has been part of the culture and commerce of Washington state for thousands of years. Washington’s traditions, expertise, resources, and location puts the state in a pivotal place in the seafood economy of the entire Pacific Coast. For over 40 years, Washington Sea Grant has been supporting the state’s seafood industry through providing safety training, technical guidance, and research for Washington state fishing and seafood communities. It’s not surprising then, that Sea Grant is involved in the Bellingham SeaFeast, a two-day festival showcasing and celebrating the town’s marine heritage, working waterfront, commercial fishing and seafood industries, and the culinary bounty of this corner of the Pacific Northwest. Now in its third year, the festival attracts people of all ages down to the harbor for two days of waterfront activities, opportunities to learn about marine science, and most of all, delicious seafood. On a Friday afternoon in September, Washington Sea Grant science writer Samantha Larson and I drove up from Seattle to Bellingham to do outreach for Sea Grant at the festival. By the time we had gotten through the I-5 traffic, we were properly hungry. Good thing for us, we had tickets to the first event of the festival: SeaFeed at the Harbor. Families and friends gathered at long tables to try the best of what the ocean could offer: Dungeness crabs the size of dinner plates, salmon prepared in the traditional way of the Lummi Nation, and locally-grown grilled oysters. It was my first time eating Dungeness crab, and while it was delicious, I was definitely thankful for the bib and wet wipes provided. Also, shout-out to the local sitting next to us who recommended squeezing the lemon wedge on our hands to get rid of the stickiness - that really worked! Saturday morning started out in true Pacific Northwest fashion: with rain. By the time Samantha and I got to the festival, MaryAnn Wagner, Washington Sea Grant’s Assistant Director for Communications, had done the hard work of getting our booth set up. 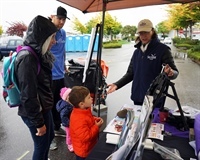 The rain and wind were brutal, and we were worried that no visitors would stop by to learn about all the cool stuff Sea Grant does (and get cool fish-shaped carabiners!). Luckily for us and the festival organizers, the sun broke through around noon, which combined with the aroma of delicious food, enticed people to come on down. One of the highlights of the day for me was getting to experience the U.S. Coast Guard Rescue at Sea demonstration organized by Washington Sea Grant. The Coast Guard helicopter flying over alerted festival-goers that the demo would be taking place soon in the harbor, only a few steps away from our Sea Grant booth. As crowds gathered along the water’s edge, the emcees, which included Sea Grant’s MaryAnn, provided details and commentary about the actions of the Coast Guard’s helicopter and boat. Guard members demonstrated a variety of rescue techniques, including deploying a rescue swimmer and lifting a "survivor" into the helicopter. After the Coast Guard demonstration, Sarah Fisken, Washington Sea Grant Marine Operations Specialist, and I went down to the docks to tour some of the commercial fishing boats who opened their doors (er, bows?) to visitors. Sarah was the perfect person to tour with - she came to Sea Grant in 1982 from commercial fishing, a background that is perfect in her current role improving safety and operations on the water. She started fishing in the 1970s in Puget Sound on a troller and worked in the Bering Sea and for nine seasons as one of a handful of women in the purse-seine fleet out of Southeast Alaska. Sarah now coordinates Sea Grant’s U.S. Coast Guard-approved safety classes, which have been widely credited with reducing fatalities at sea, particularly in tribal fisheries. As we fought our way through traffic back to Seattle, I thought about how the Bellingham SeaFeast was a great opportunity to reflect on my Knauss fellowship year as a science communications specialist. The event was an awesome way to see how Sea Grant connects with communities!